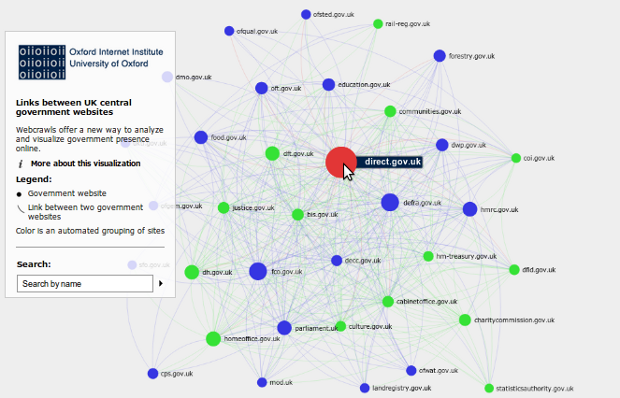 Scott Hale, of the InteractiveVis project team, will lead an introductory talk on network visualization next Wednesday, 7 November at Oxford’s IT Services. All from the university are welcome to this free event. The talk will cover basic steps to collect, clean, and visualize network data using two desktop software solutions: Gephi and NodeXL. There are also some online solutions to capture network data including: 140kit to capture Twitter data and NameGen to download a network your (own) Facebook friends. 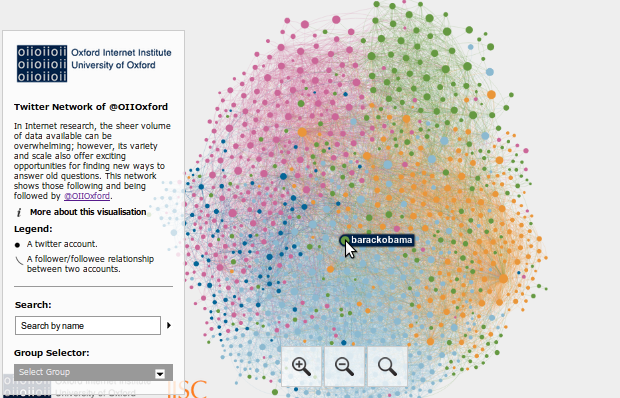 The InteractiveVis project aims to help you share these visualizations more easily. The talk will cover existing desktop software methods to prepare static images for posting on a web, but will then turn to how to create interactive network diagrams like those below easily. The InteractiveVis project team is working finish testing and deploy a step-by-step process now.